In 2016, Russia finished in 21st place in the world ranking of the most celebrated video commercials. In the run-up to the Red Apple International Advertising Festival on Feb. 16 and 17 in Moscow, RBTH showcases four Russian video commercials that are internationally successful and famous. 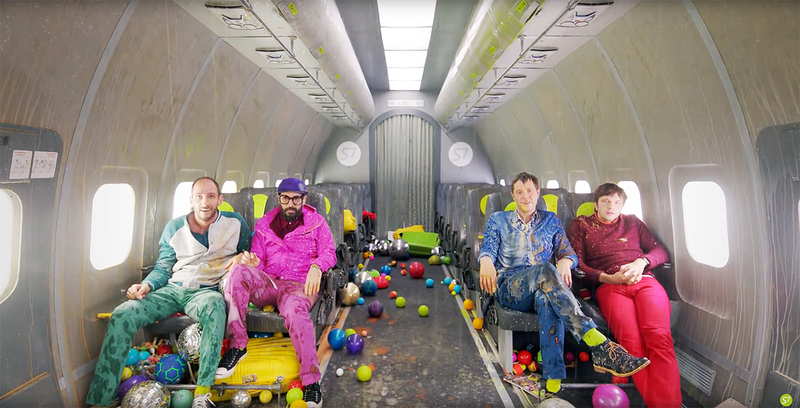 This video clip is set to the song, Upside Down & Inside Out, by OK GO. It was completely shot in zero gravity, and the commercial has won more than 50 awards, including three Lions in Cannes, and was even nominated for a Grammy. The commercial was shot at the Gagarin Cosmonaut Training Center in Moscow, and it takes place on board a custom-built IL-76MDK airplane-lab. To achieve zero gravity, the airplane flew on a parabolic trajectory, sharply soaring up and then down. The musicians found themselves halfway in the air for about 20-30 seconds. In total, 21 flights were needed to make the three-minute video, which is more than the yearly norm for astronaut training! Altogether, the musicians flew in mid-air for two hours and fifteen minutes. In its first day, the commercial was viewed more than 20 million times on Facebook, received 240,000 likes, and was reposted 333,000 times. A little girl asks Santa Claus for the return of her mother, who works too much. Father Frost kidnaps the woman and takes her through all kinds of severe obstacles to push her to remember her family. The video was shot in parts of Russia and Georgia, including remote areas and mountains 10,000 feet high. More than 130 people from different countries worked on the project, which was directed by Charlie Stadler, one of the top-50 directors of video commercials ranked by Filestage. The soundtrack was made by Grammy-winner Adrian Bushby, and recorded by the Oscar-nominated Bulgarian Symphony Orchestra SIF 309. The video was heatedly discussed, and many people took to social media to say the depiction of working mothers is incorrect, and too harsh. The commercial debuted at the exhibition opening to mark the 200th birthday of the great Russian seascape painter, Ivan Aivazovsky. The video tells the tale of the spirit of love in marine poetry, which the painter held dear all his life. The video is based on the first seconds after the painter’s death on May 2, 1900 in Crimea, when he was 83 years old. Aivazovsky was working on the painting Explosion of a Turkish ship, which is still unfinished. The creators managed to make the video light and poetic instead of tragic, and it was highly appreciated by the public as well as by professionals. The commercial won several awards, including one at the Epica Awards, and it also went viral on the Internet. This campaign earned Sberbank its first Lion in Cannes. As part of the social project, ‘Streets,’ the bank asked street artists from 11 cities in Russia to not only accept cash donations from people on the streets, but also through SMS and transfers on credit cards. During the campaign, commercials were shot that mentioned that every artist has his own reasons to perform on the street. For most, it is a special kind of art, which is also a way of fulfilling certain goals and dreams. A distinctive feature of the campaign was the fact that the bank’s name was not mentioned; signs of the artists and posters explained that transactions are easy to make. To support the project, a big campaign was launched on the Internet, in the media, and on the radio. As a result, the program’s website received 100-200 applications per day.